A few years ago, while browsing my public library’s used book store, I discovered a book with a curious logo. The logo depicted an apple, but the apple had a sinister jack-o-lantern face and was framed by orange cobwebs that sprouted from either side of the book’s cover. The words framed around the jack-o-lantern apple read “Apple Chillers”, and the book was titled Ghosts beneath Our Feet by Betty Ren Wright. I hadn’t seen this book, or this line before, so I picked it up for my collection. Not long after I came across another Apple Chiller titled A Ghost in the House also by Betty Ren Wright. Both of these books sat on my shelf, undisturbed, waiting to be read, until recently when I began routing through my library for children’s horror fiction, written by women, to review for Women in Horror Month. 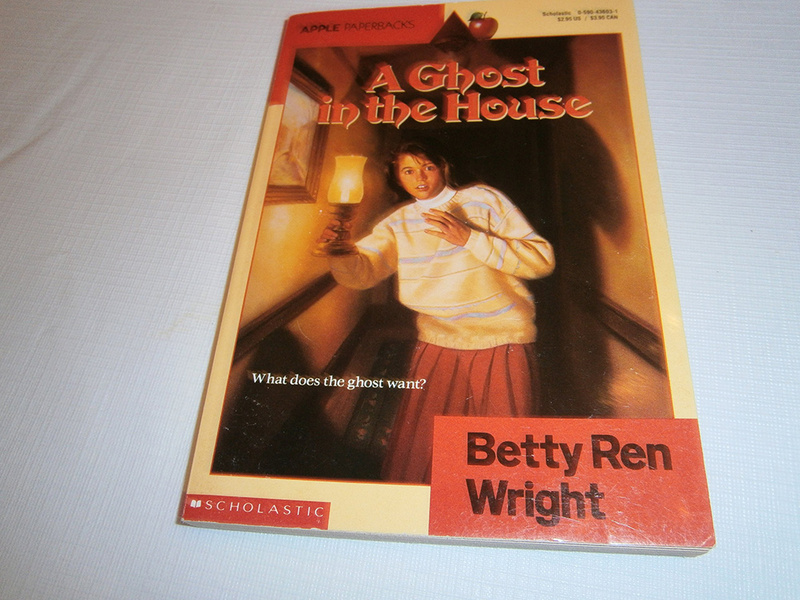 In my search I once again came across A Ghost in the House by Betty Ren Wright, and decided to read and review it. From reading A Ghost in the House I not only discovered my new favorite writer in children’s fright fiction, but that my new favorite writer is a writer I’ve read before. In fact, I own other books, besides A Ghost in the House and Ghosts Beneath Our Feet, by Betty Ren Wright and other authors featured in the Apple Chillers line — I just own different editions. While this was a cool discovery, it was far from surprising. Collecting books, especially children’s horror books, can lead one to acquiring multiple editions of a book without even knowing it. As I’ve mentioned previously, when I go to book sales in search of children’s fright fiction, I go on bag sale days and indiscriminately buy everything that’s there. I’ll read the titles and look at the covers. But in the end, if I don’t immediately recognize that I have it, I stuff it in one of the four or five shopping bags I’ve been given at the door. As a collector, I don’t mind getting multiple editions of one book, especially if it’s really good, and A Ghost in the House is just that! 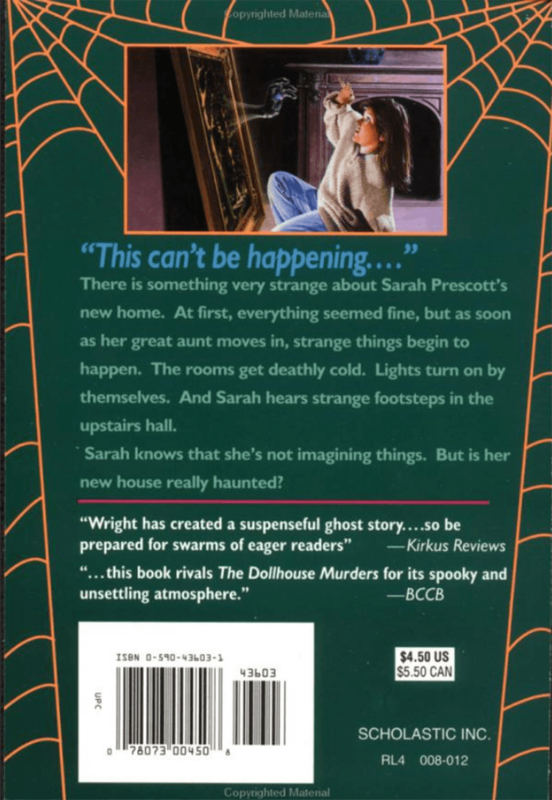 Originally published in 1991 A Ghost in the House follows Sarah Prescott as she and her family adjust to living in a large old house with Sarah’s great aunt. Sarah’s great aunt moves back into what was once her childhood home, not long after Sarah’s father loses his new job. Finances were tight enough for the Prescott’s, and had been for a long time, but with this new job things had gotten better. Now money is back to being rationed, and the only way Sarah and her family can afford to stay in their new home is if they can get Sarah’s great aunt to live with them. As it happens, getting her to live them isn’t the hard part — getting her to continue living with them is! There’s a malevolent force in the house determined to take its revenge. But not just on any one. Sarah and Sarah’s great aunt are the focus of its rage, and no one believes them. I had a great time with this book. It genuinely scared me a few times and it kept me guessing. 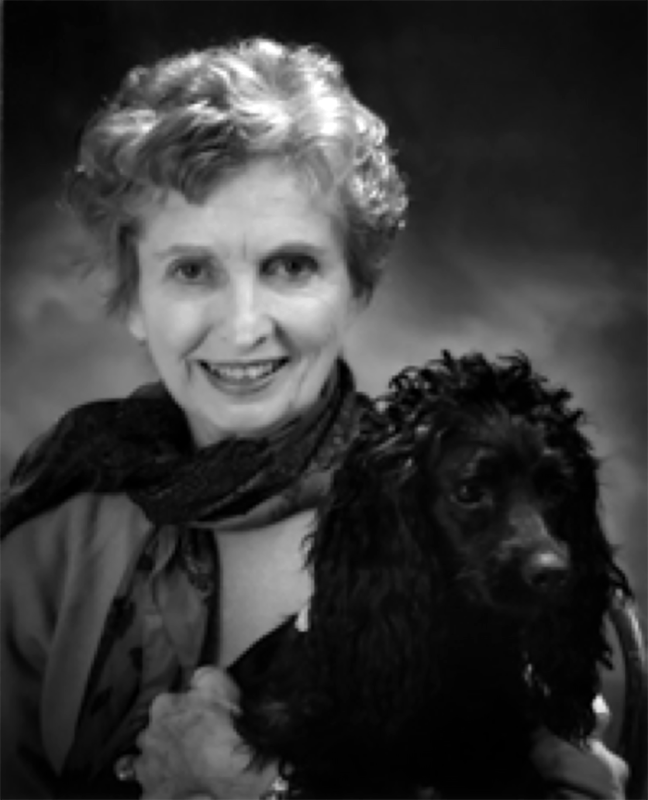 Betty Ren Wright, like Mary Downing Hahn, is a master at creating ghost stories that frighten and delight. Unlike Mary Downing Hahn through, Betty Ren Wright is much more plain and frank in her choice of words and delivery. Just like Sarah’s great aunt. 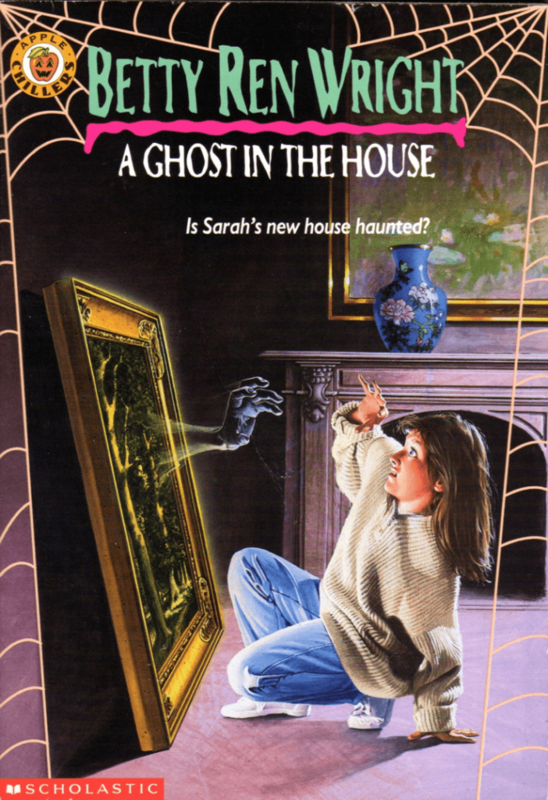 Honestly, if you’re looking for one good reason to invest a few hours (or a few bucks) into A Ghost in the House, do it for Sarah’s great aunt. She’s hilarious. Finally, I would like to say that if you’re a fan of the 1982 horror hit Poltergeist, you should make A Ghost In the House a must read. 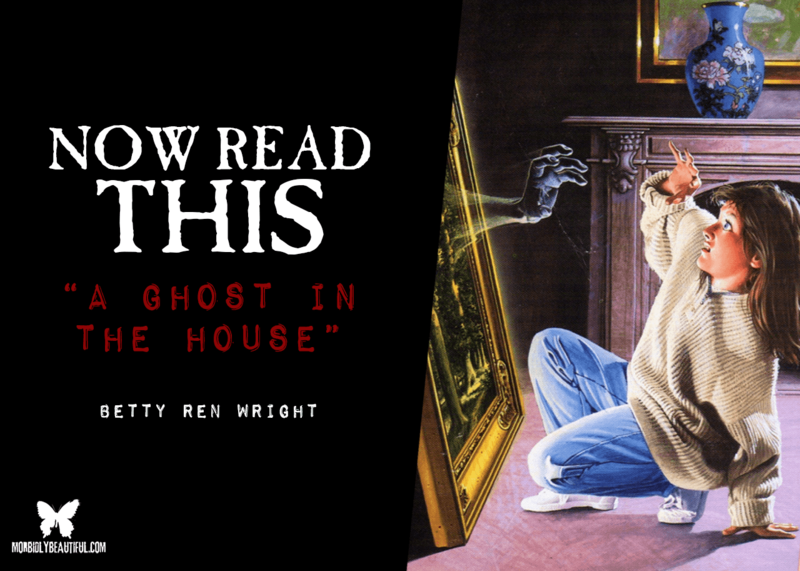 I hope you enjoyed this review, and I hope you seek out A Ghost in the House (and all of Betty Ren Wright’s other scary books) for your haunted home.